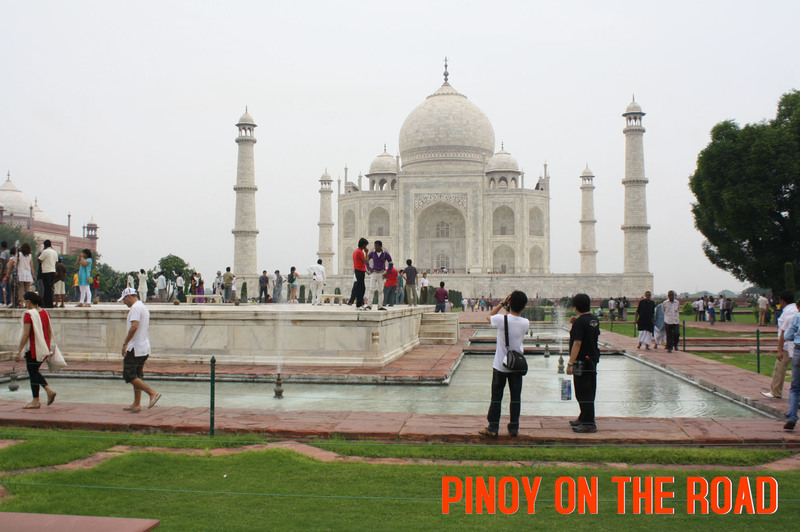 Taj Mahal is perhaps India’s most recognizable landmark. 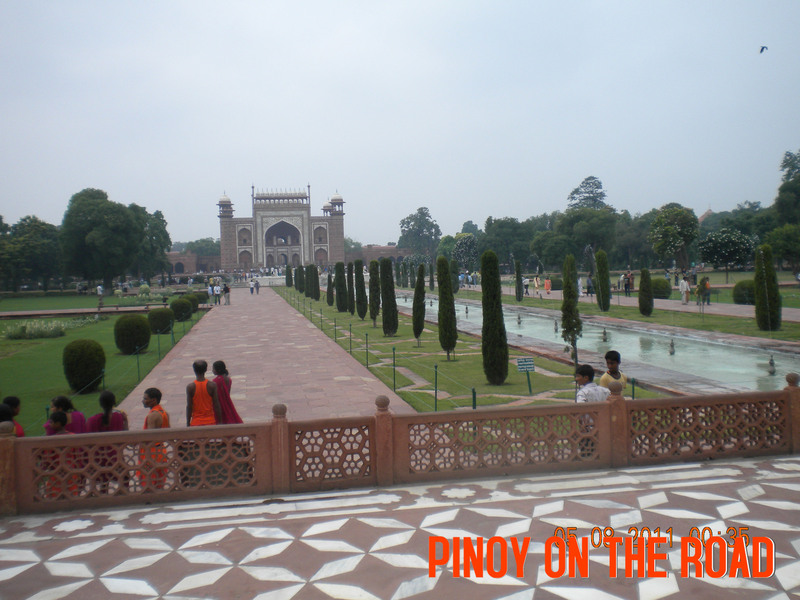 It is located in Agra, some 2 hours away by train from New Delhi. 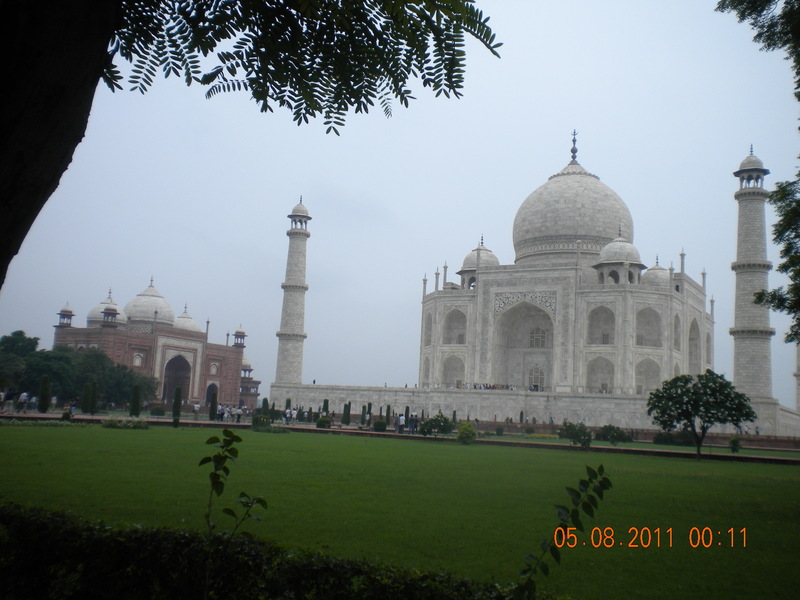 Agra is easily accessible from New Delhi by bus or train. I opted to reach Agra using train because if by bus, it will take me 4 hours. I got down at Agra train station (Cantt Station) and hired a tour guide who has motor cycle. The choice of Agra as the location where Taj Mahal is to be erected has no historical or significant reason or any reason whatsoever related to the King, royalty, whatever. 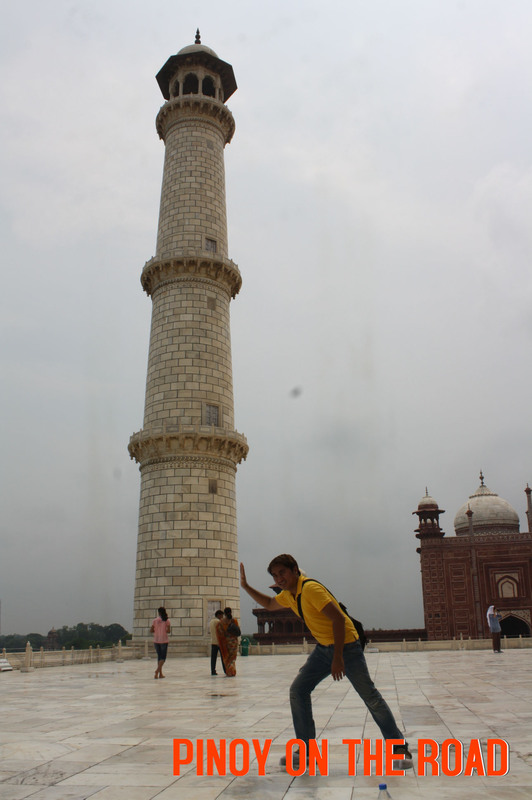 The only reason is that, only the soils of Agra can withstand such a huge weight of marble. 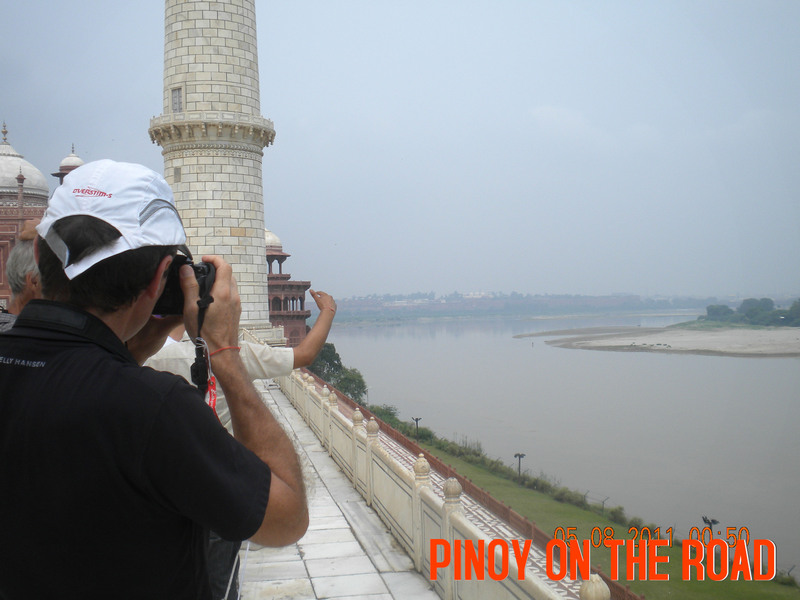 It is built near the riverbanks of Yamuna River in order to easily transport the materials for its construction. Taj Mahal is surrounded by 3 gates while the other side is a wall facing the river. 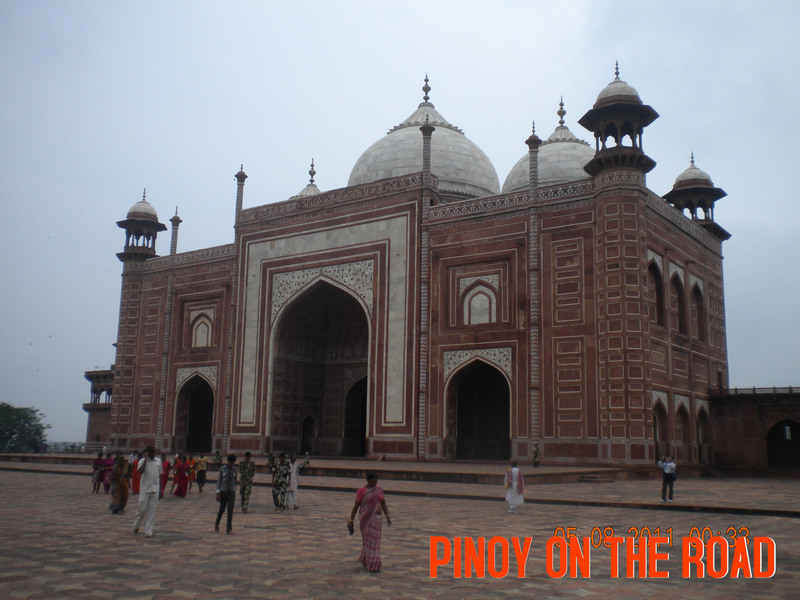 The main gateway is called Darwaza-i rauza, red in color but is made of marble. The main archways is similar to the Taj Mahal’s archways. Halfway in the garden between the tomb and the gateway is a raised marble water tank with a north and south pool that reflects the mausoleum. This is called the Tank of Abundance. Elsewhere in the Persian inspired garden are avenues of trees and fountains and free flowing water. The dome is perhaps the main focus of the tomb. 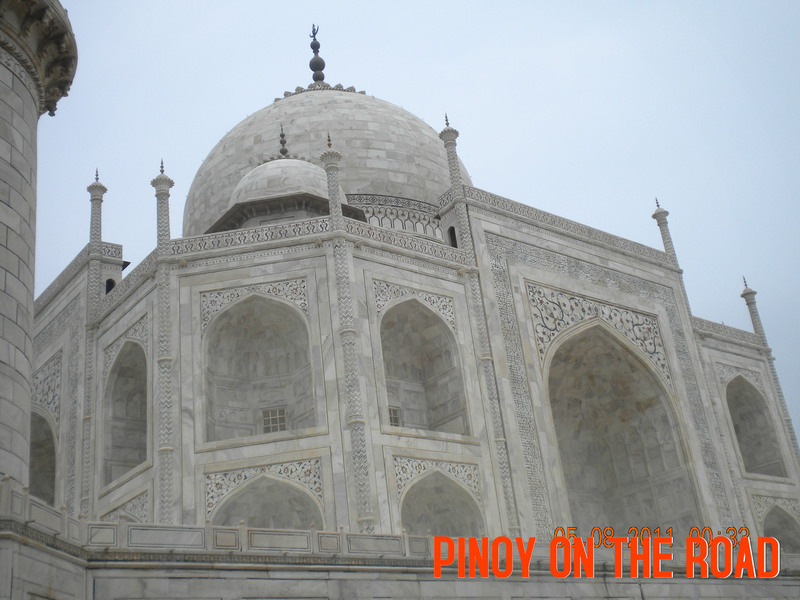 It is made of white marble (of superior quality) and stands 35meters high, the same length as the base of the tomb! The dome has 2 layers forming like an onion. The tomb is primarily Persian in origin decorated with lotus designs. 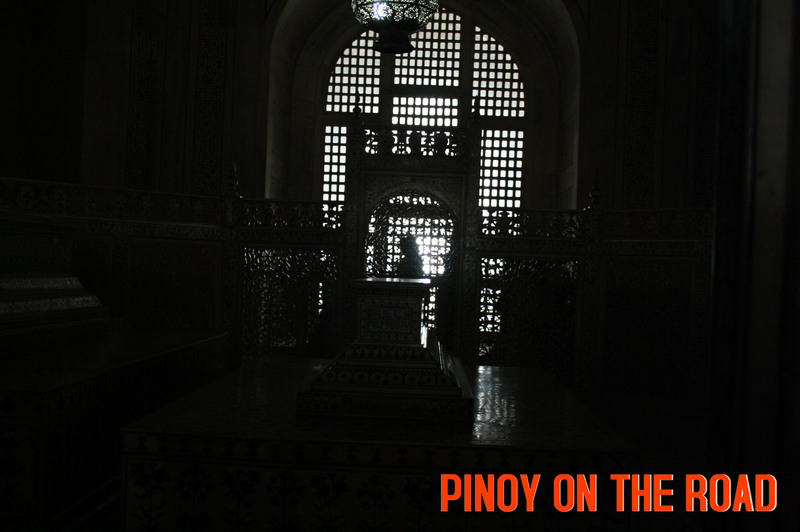 The tomb is perfectly symmetrical on all sides – inside and outside, whichever side! The tomb has 4 kiosks posted at its corners that replicate the main dome. It is said that the kiosks give emphasis to the design of the dome as well as the height of the tomb. The 4 kiosks are not straight. They are rather tilted outwards! The reason is to protect the tomb even when the kiosks are destroyed or collapsing! Cleaver, huh. 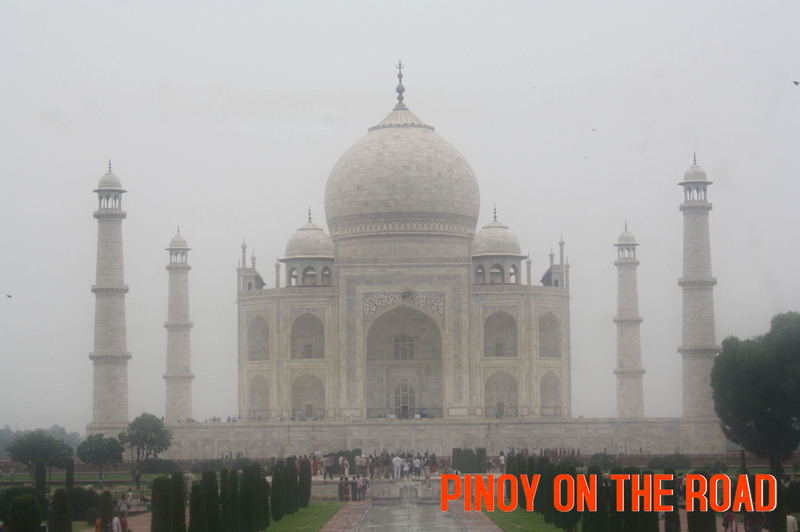 The center of the tomb is the sarcophagus of Mumtaz Mahal (the Queen whom the Taj was dedicated). What is seen in the main chamber is the false one. The original or actual graves are at the lower levels, unaccessible. Both Mumtaz Mahal (the Queen) and Shah Jahan (the Emperor who built the tomb) are buried here. Camera is not allowed here and therefore photography. My hard-headed local guide however was able to take a picture using my camera! Taj Mahal is considered as a jewel in India and among the universally admired masterpieces in the world. It is a combination of Persian, Indian and Turkish architecture. 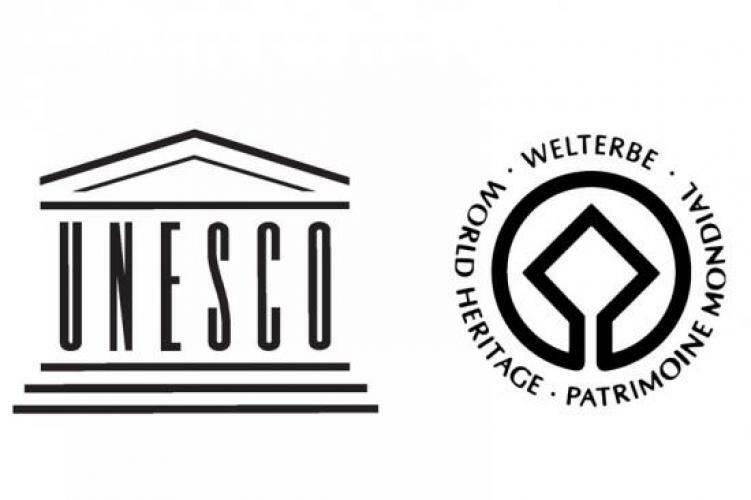 It is officially inscribed as UNESCO World Heritage Site in 1983. It was completed in 21 years. Apart from all the physical attributes of Taj Mahal, my guide said that the most important thing one can say about the Taj is its a work of love. He said that a visit to Taj must not only make us wonder of its architectural prowess but rather reflect on the reason – which is love – why Taj was built. Train is the best way to get from New Delhi to Agra (where Taj Mahal is). There are several options, though the most convenient choice is the Shatabdi Express, which departs New Delhi Station at 6:15 a.m. every day. Light meal is served en route. The Shatabdi makes the journey to Agra in about two hours. Another train is Taj Express, which departs at 7:15 a.m. The slower, non-airconditioned and cheapest train is Punjab Mail which departs New Delhi Station at 5:30 a.m. and makes the trip to Agra in four hours. Taj Mahal visitors will get off at the Agra Cantt station no matter which train they choose to ride. Return trains can usually be caught between six and eight in the evening. Tickets can be bought at the station. There are online agents that sell as well. Just be careful of scams. 1. Never, never, never accept any water, coffee, tea or food offered to you at whatever cost. Never drink or eat whatever they offer you. 2. Never eat in a local restaurant they tell you. There is Pizza Hut nearby, just go there. 3. Do not bring too much cash or your credit card. 4. Always say no to any offer that is too good to be true. 5. Trust your instinct. Don’t get fooled. One of the places I love to visit. Thanks for the tips. It made me wiser because I will go to India next year. Wow….really nice view…I see it only through pictures..how I wish I can visit too. hi catherine, it is indeed. have this ticked-off in your bucket-list! i know you will be here! it is leo. been here? 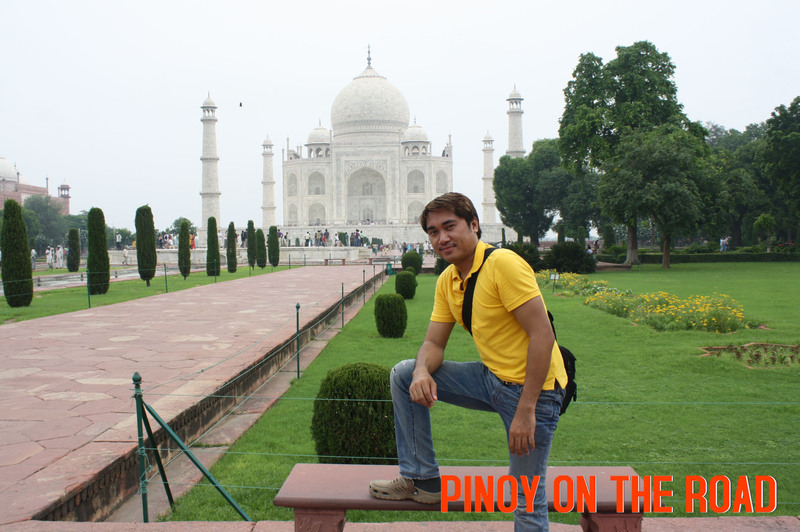 Taj Mahal is one of the wonders I’d want to visit too as it is high among the world’s top attraction. That takes us up to the next level. Great ponistg. I really wanna visit Taj Mahal.. I hope I can visit someday..
and what is nice is, you get visa on arrival in india. so no need to secure a prior visa. This is an exceptionally usfuel post. It certainly sparked my curiosity on many points. I believe most of the elements and I’m currently contemplating all the rest. Thank you so much for keeping the information so engaging. It’s hard to argue about incredibly good inotmraoifn, and you’ve got presented your points in an smart fashion. I personally agree with you on many points you tend to make right here and I thank you.